Anywhere it can rain, it can flood. You don’t have to live near a body of water to experience flooding. Flash flooding, inland flooding and seasonal storms all happen in this area. 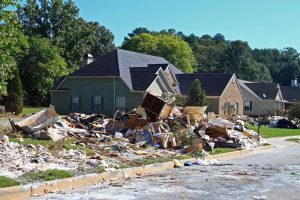 Flooding is the most common natural disaster in the United States ahead of windstorms, epidemics, even earthquakes and hurricanes. Did you know that when you live in a flood plain, flood insurance may be mandatory by your mortgage company? This is separate from your homeowner policy which does not cover flooding. Many people think it does. You can purchase flood insurance no matter where you live but you can’t get it right away. In most cases, there is a 30 day waiting period. You can even get flood insurance if your house has been flooded before. This is a federal program and your community needs to be a participant for you to be able to purchase flood insurance. Anyone is vulnerable to flooding. It is noted that 25% of all flood insurance claims have been made by people who live outside the mapped high-risk areas and they have received about one-third of Federal Disaster Assistance for flooding. There are low cost Preferred Risk policies that provide flood protection. Renters and business owners are also eligible. If you are interested in finding our where your home lies or want more education and information, please give us a call.